These high quality air filled balls are 8cm in diameter. 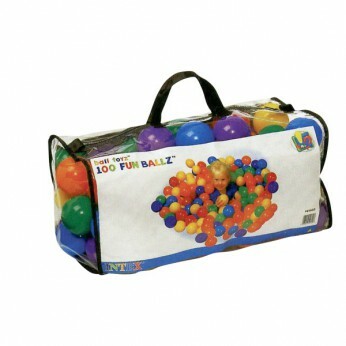 Each set comes with 100 balls in 6 assorted colours (red, green, blue, yellow, orange and purple). Recommended age 3 years +…. This toy costs approximately £14.99 (for the latest and best prices make sure you check our retailer list for the 100 Fun Ballz above). In our review of 100 Fun Ballz we classed it as being suitable for ages 1 to 3 years but recommend you check the manufacturer specific advice before purchasing.